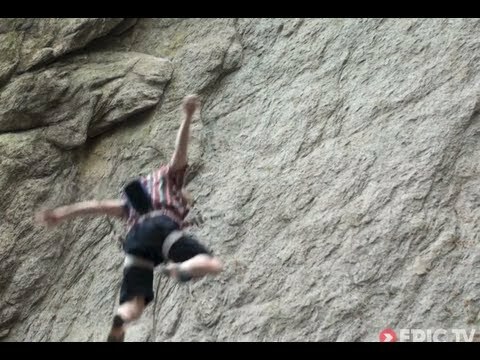 This climb was an abandoned sport project located in the Boulderfields of Kelowna BC. The climb was tentatively graded 5.12d A0 with two drilled pockets. During Sept of 2007, my friend Mike Shannon showed this colorful line to me and I fell in love with the beautiful overhanging feature and impressive rock. After three hours and two lengthy roped sessions, I was able to solve a smooth sequence that avoided the chipped holds. I cleaned it well and wondered if I had the balls for a solo attempt, I knew I could fall, but I also had the moves perfectly in tune. I made an impulsive decision to remove my harness and off I went on a mindful adventure. The contrast between the first burn and the solo really made me appreciate the mental mastery and memory involved for this. Wow.